Banish the Monday blues by learning to pull shapes like a pop queen at Drink, Shop and Do’s Baby One More Time – Britney Spears Dance Class. Gym clothes and trainers recommended. Urban realism meets fairytale fantasy in Beautiful Thing (pictured above), a new outdoor dance-theatre reimagining of Jonathan Harvey’s 1993 play charting the love story of two teenage boys in London’s south Thamesmead. In celebration of London Pride, it’s the finale of Greenwich+Docklands International Festival, brought to life in and around the original location where the play (and Channel Four film) were set. Featuring digital projections by NOVAK, new music by Roma Yagnik and a community chorus, this is a love story to watch as the sun goes down. After a thundering run last autumn, Hofesh Shechter Company’s crowd-pleasing Grand Finale returns to Sadler’s Wells with its beautiful and bleak vision of a world in freefall. With design by Tom Scutt, Grand Finale features original music by Shechter and an on-stage band playing on throughout the anarchic energy and violent comedy. In Goldberg Variations – ternary patterns for insomnia at the Barbican, five contemporary dancers from Stockholm-based company Andersson Dance join forces with 11 classical musicians from the Scottish Ensemble to take on Bach’s timeless suite. Expect a playful yet profound interpretation of one of the most celebrated pieces of music ever written. Graduating students from London Contemporary Dance School showcase their talents with a run of five performances at The Place, performing choreography by Theo Clinkard, Julie Cunningham, Simon Vincenzi and Rachel Young, in works inspired by the young artists. Edinburgh Festival favourites Circolombia return to the UK with their critically acclaimed show promising ‘guts, grace and gusto direct from Bogota’. 13 performers showcase mind-boggling circus skills whilst taking terrifying risks live on stage. See them at Underbelly Festival on the Southbank. 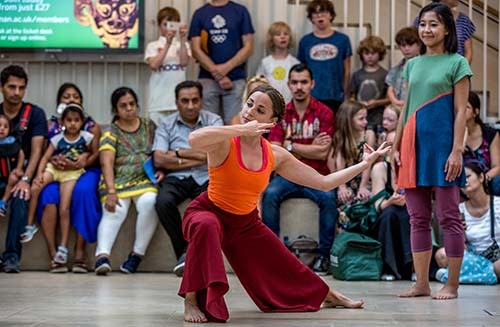 Head to the Festival of Dance at Horniman Museum for a family-friendly day of activities celebrating dance and music from around the world. Co-produced with Trinity Laban, the line-up includes the chance to experience dance from Eastern Europe and Latin America in the museum’s gardens.